So, over the course of what few free evenings I have had, the rest of the large group of orks have progressed and have been finished. Painting many figures does take ages, even when doing it as basic as this. I have decided that I will not ever be using that dip again. In the future I will stick to the brush on ink version of quickshade. Far better control leading to far better results, no shinyness, dries in an hour or so and water soluble. Overall a much better product for my needs. I had forgotten what a messy sticky substance the tinned quickshade dip is, how it is difficult to be precise with it, how it takes several days to dry properly, how hideously shiny it is when dry, and how difficult it can be to get rid of the shinyness…especially when the ambient humidity rapidly increases to raining cats and dogs right after spraying them! ARGH! so instead of some nice orkses, we get frosty the snowmen! Frosted! not grrrrrreeat at all! At this point I might have said a bad word. 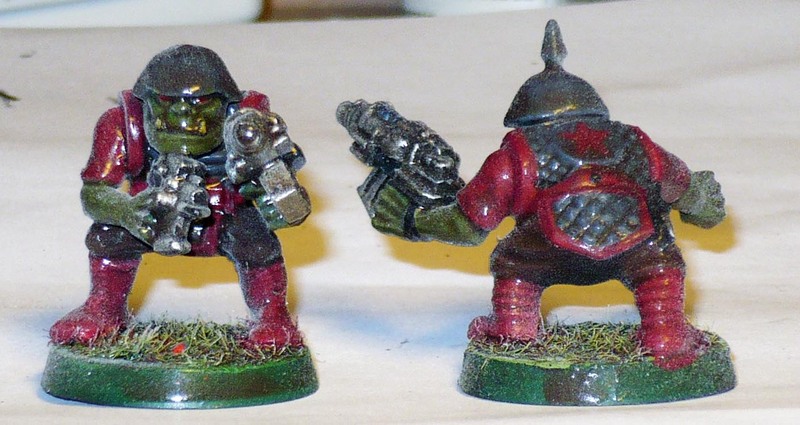 So all the orks have become frosted some more, some less. I got partially rid of the frosting with a second coat of varnish, but some remains. and still some shinyness her and there. Bah! They might still get a third coat of varnish just in case it might still get rid of some more of the frosting effect. 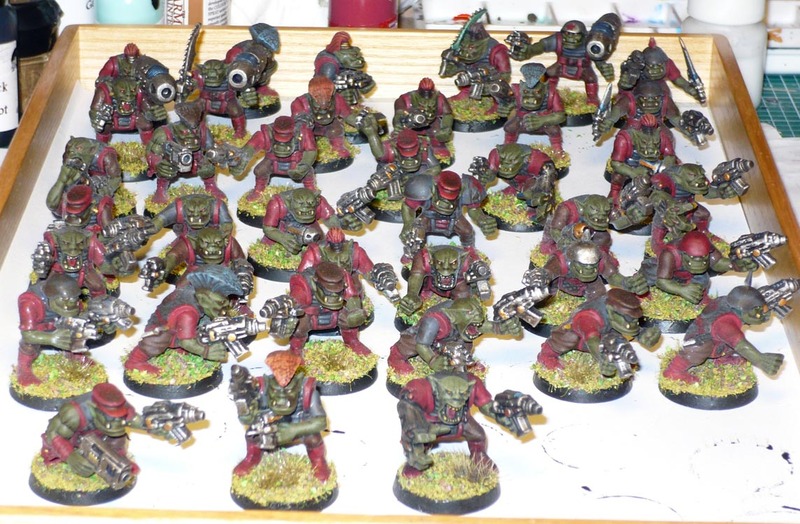 So that is 38 more boys ready to take to the field in rambunctious waaagh! Certainly not in any way a great paint job, but perfectly passable for the tabletop, especially considering the starting point.